For example, the Topaz T-S460-HSB-R Signature Capture Pad, this device uses USB HID, with RemoteApp and RemoteFX USB redirection enabled, it does not work. Using this framework will allow all Topaz Signature Capture Pads models work with Remote App (RDP, RDSH) and Citrix too. Currently, there is no solution for these specific needs. Application developers for Citrix / Terminal Services solutions usually have to spent a lot of time to do research on a portable solution for this problem. Virtual Channel COM Service Framework provides application developers the quickest way to do their work, the framework provides a COM based standard set of methods that can be used with .NET or any COM compatible programming language like VB, C++, Delphi, PowerBuilder. 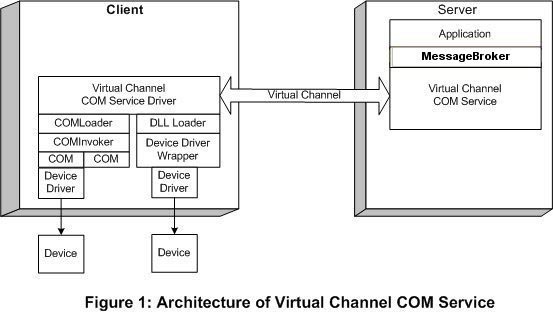 Virtual Channel COM Service Framework uses Citrix/Terminal Services Virtual Channel as transport layer for forwarding function calls from the server to the client machine and getting back the result or any error information resulting during the call. Virtual Channel is a bidirectional error-free connection for the exchange of generalized packet data between the Server and the Remote Client (ICA or RDP). Based on Virtual Channel, the framework benefits all the performance, error correction feature of ICA/RDP data stream, that means it is very fast and reliable with a very little over head when packing and unpacking data before sending to other side. Virtual Channel COM Service Framework consists of two parts: server-side and client-side. Components on the server side are responsible to format a specific request message and break it into many small packets that can be sent through the Virtual Channel. Through a COM object interface, application on the server specifies COM object name ( installed on client machine), its method and arguments and the framework performs the request to the Virtual Driver seating on client machine. On the client side, when a message coming, the Virtual Channel driver cumulates all the packets received and when the whole message is received, the Virtual Channel driver invokes the creation of COM object locally on client machine and calls the method of this COM instance. The result or error information is sent back to the server through the same Virtual Channel. The COM object on the client machine, can be a wrapper of driver for specific device (POS printer, Card Reader (MSR), Signature Pad, Finger Print, etc) or any business logic that programmer want to do on the client machine. The demo version will expire on September 15th, 2018. All components will stop working after that date.